Don't spend money on pricey flash extension cords, you can make a cheap and effective extension using CAT5 cable. 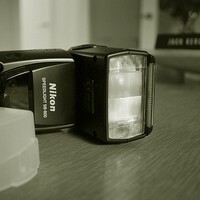 Over at DIYPhotography.net, Udi found that his TTL—through the lens—Nikon flash extension-cable was a bit too short. He didn't want to shell out even more money for an only slightly longer cord, so he bit the bullet and sacrificed the cable he had to his experiment. I cut the TTL cable in half, stripped back the rubber shielding and I used 2 Cat5e network wall jacks, 1 for each end. Cat5e cabling and jacks consist of 8 wires, so it was a perfect match for this. The other aspect of those cables is that they are shielded - after all, they transfer high amounts of traffic. His gamble with the cable paid off, network cable was the perfect match to create an extension. He tested it with both 5ft and 50ft lengths of CAT5 cable with no apparent delays in the flash triggering. Given the small fortune he would have spent on a propriety extension cord of that length—if he could even find one 50ft long!—he saved a bundle with his cable modification. If you have ingenious money-saving camera hacks of your own, share the wealth in the comments below.Photo by pieterjanviaene.